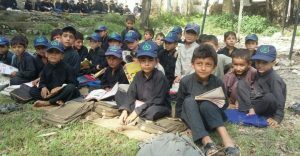 KALAYA: Around 150 students of Drun Shaikhan Primary School in Orakzai tribal district are forced to study under open sky for last 10 years. They are forced to come and sit broken floor of the school with destroyed building, demolished rooftops and burnt and cracked walls. There is neither clean drinking water available at the school nor toilets, forcing them to go to nearby mountain to answer the call of nature. Most of students bring water in plastic bottles from their homes. “What the government wants to show and teach our children, what our children will perceive when they see these blown up rooftops and walls of the school,” asked Haji Abdul Samad, a local elder. The school was blown up by militants 10 years ago when militancy started in the area. “Funds have been approved and this school will soon be reconstructed is the answer we get whenever we ask education authorities,” said Basit Orakzai another local. Authorities concerned have been making promises never to fulfill them, locals lamented. 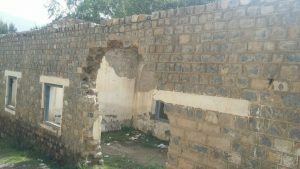 They added that 10 years have passed but neither the school was reconstructed nor alternative arrangement made to provide conducive environment to the students where they could learn something. Children are sent home in case of light shower, locals said, adding that they come and take classes in chilling cold of winters and scorching heat of summers. Moreover, there is only teacher for 150 students for whom teaching so many children is impossible. Locals also criticized former member National Assembly Ghazi Gulab Jamal promised to include the school in public sector development fund but he too reneged on his promise. Parents and local elders demanded of the government to reconstruct the school. Over 5000 schools were blown up or burnt by militants when militancy swept through the region. Teachers were attacked and killed while people were forced to stop their children from sending to schools to push them into darkness of illiteracy.